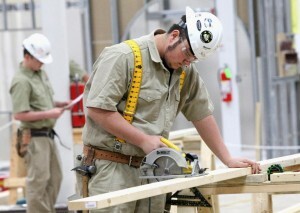 Check out our article in The Courier-Journal, "SkillsUSA Event to Draw 15,000, Boost Economy." Please contact Daren Thompson at daren.thompson@lebanonwaterworks.com for more information. SkillsUSA Kentucky is a partnership of students, teachers, and industry representatives working together to ensure Kentucky has a skilled workforce. The organization helps each student excel. SkillsUSA Kentucky is a member of the SkillsUSA national organization serving teachers, and high school and college students who are preparing for careers in technical, skilled, and service occupations. Programs: SkillsUSA Kentucky programs include local, regional, state and national competitions in which students demonstrate occupational and leadership skills. At the annual state SkillsUSA Kentucky Leadership and Skills Championships, approximately 1,000 students compete in 99 occupational and leadership skill areas. KCUC is a sponsor of the annual state SkillsUSA Kentucky Leadership and Skills Championships. KCUC provides industry judges, supplies for the competition, and outstanding prizes for first through third place winners of the Carpentry competition.